Need a little help choosing what to bake for the big day? There are a few things to keep in mind while you make your decision. 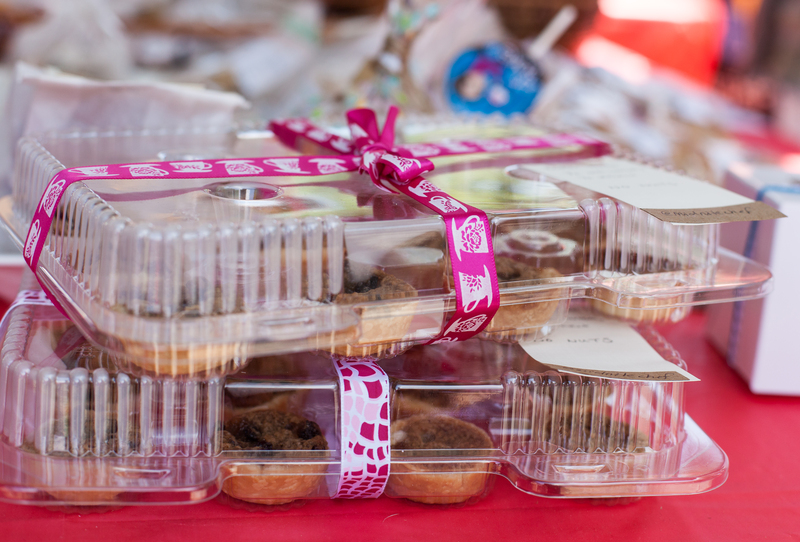 Here are some tips to help you make the most out of your bake sale contribution. Try to choose a sturdy recipe, something that will do well without refrigeration. Things like cookies, muffins, and biscuits tend to do well, but items with fragile bits, like cream cheese frosting, custard, and whipped cream aren’t ideal. Batches of cookies are a classic choice, and always popular, as are muffins, scones, cake balls, and granola bars. Larger items, like whole pies, loaves of bread, and spice cakes are real show stoppers too. If you’d like to do something a little more outside the box, consider homemade jams, preserves, granola, or doggy biscuits. 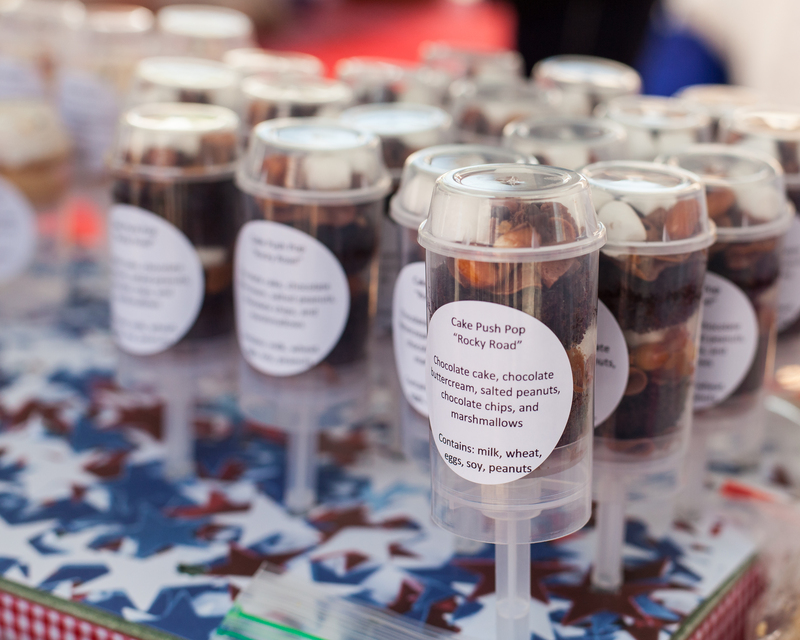 According to Austin health codes, bake sale items need to be wrapped and packaged before arriving at the sale. You can use things like cellophane bags, paper gift boxes, or plastic wrap to package your items. Keep in mind that the prettier they look, the quicker they will sell, and the more cash they will bring in. We recommend packaging small items, like cookies, truffles, or muffins in packs of six or twelve, as batches of goodies tend to sell better than individual items. It’s super important that all bake sale items are properly labeled. This not only makes them more appealing to buyers, but it can help protect folks with food allergies or special diets. We recommend adding a big fat label to each of your items featuring a descriptive name for your baked good. If your goodies are vegan, dairy free, nut free, gluten free, or paleo-friendly, be sure to label them as such. If you have a blog, a twitter handle, or a web site, go ahead and add that to the label as well. Try to drop off your donated treats to the sale location as early as possible. This helps give organizers the best chance to move as many goodies as possible. Be sure to drop off your donation in a container that doesn’t need to be returned. It’s all too easy to lose track of tupperware in the excitement of a city-wide sale. Check out these amazing recipes from past bake sale contributors! “Vegan Black Bean Brownies.” The Happy Herbivore. Available at the south location. “Nell’s Famous Lemon Bars.” Nell Rice Gonzalez. Available at the central- Foreign & Domestic location. “Oatmeal Chews.” The Happy Herbivore. Available at the south location. 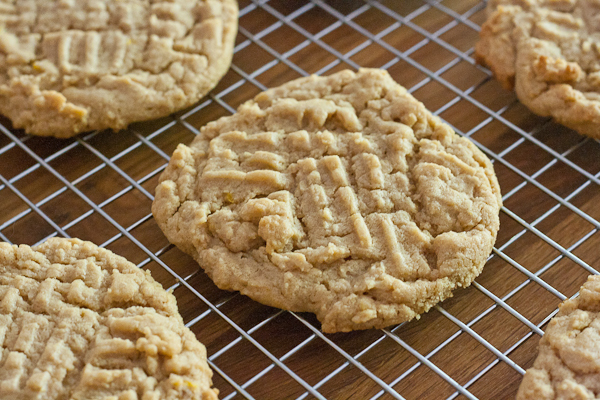 “Spiced Pumpkin Oat Cookies.” The Little Red Journal. Available at the south location. “Spiced Pecans.” And Then Make Soup. Available at the downtown location. “Sugar Cookies.” And Then Make Soup. Available at the downtown location. “Flourless Choco Almond Cookies.” And Then Make Soup. Available at the downtown location. “Sticky Gingerbread Cake.” Key Ingredient, Neysa King. “Olive Rosemary Bread.” Midnight Chef. “Spiced Ginger Cookies.” Midnight Chef. “White Chocolate Cinna-Mini Crunch” The Smart Kitchen, Elizabeth Pember. “Spiced Pear Cake.” Stetted, Megan Myers. “Coconut Lemon Sugar Cookies.” ATX Gluten Free, Jessica Meyer. “Vanilla Bean Cupcakes.” Cookie Madness, Anna. “Chocolate Skor Bar Cookies.” Cookie Madness, Anna. “White Chocolate Hazelnut Blondies.” Lisa is Cooking, Lisa Lawless. “The Pie Society’s Lemon Cheesecake Pie.” The Pie Society, Emily Ingle. “Blackberry Basil Scones.” Stetted, Megan Myers. “Green Macarons for Japan.” A Taste of Koko. “Chocolate Almond Toffee.” Tasty Type, Lauren. “Chocolate Chip Banana Cake.” Tasty Touring, Jodi Bart. Check out a visual guide to all of these fabulous recipes on the Austin Bakes: Bake Sale Recipes Pinterest Board. This entry was posted in Austin Bakes for Austin, Blog, News about the sale, Past Sales and tagged Austin Bakes, Austin Disaster Relief Network, Austin Flood Relief, Austin Texas Bake Sale by Mary Helen Leonard. Bookmark the permalink.